The rapid growth of kayaking has taken the world by storm, and it does not look like it will be slowing down any time soon. Reports and surveys from various organizations have shown consistent double-digit growth numbers over the past couple of years, with increased kayak sales and sport participation going hand-in-hand. And it’s certainly no surprise! Kayaking is a fantastic activity that combines a full-body workout with the opportunity to bask in the glory of nature and the great outdoors. It’s not a very expensive hobby, either – a couple of hundred dollars’ worth of gear will nab you pretty much everything you need to get started. Us at WhiteWaterCoach.com are avid kayakers and have loved kayaking for many years. That said; a trendy and accessible hobby with such a low barrier to entry often comes with a lot of newbie baggage, such as people not knowing basic safety or wearing proper gear. There is a lot to unpack here, and it is more than just your clothes and life vest. In this article, I am going to give you a crash course on kayaking, teaching you the basics of everything from how to choose a kayak in the first place, what to wear, and to how to get into a kayak and not look like a fish on land. Do you know what to wear when kayaking? A lot of people think that all you need to have is your Personal Flotation Device (PFD), or life jacket, and a little bit of swimwear, and you are good to go. Here is a guide on PFD requirements. That is not all you need to pack, though. For starters, you have to make sure that your PFD is the right fit for you! To test, wear the clothes you would normally wear while paddling, then put the PFD on. Tighten all the straps, beginning from the waist, and ending with the shoulders. Try moving around – it should be a tight fit, but it shouldn’t chafe around your arms when you move. It would also be helpful for your PFD to have a whistle attached so that you can call for help in case of emergencies. Aside from your PFD, you will also want to work on your clothes. Wear swimwear that does not bind and is not made of cotton, a rashguard to protect against sun exposure, and kayaking footwear to avoid abrading your feet against sharp rocks in shallow water. You may also want to add a hat to shield against the sun. Warm water is nice and comfortable for any kayaker, but when the weather gets cold, safety becomes paramount. You could very quickly get hypothermia without even noticing it, running out of gas before you can get back to shore. Always wear a wetsuit or drysuit of some kind when the water is especially cold. If you are going out on a multi-day excursion, for instance, a kayak camping trip, then you need to be sure you check the weather be departing so you can be sure you have the proper gear o protect you from the elements. One of the most important aspects of gearing up to kayak is selecting the right size paddle. The wider your boat is, the longer paddles you will need. Another factor would be what your height is because the taller the paddler then the longer the paddles have to be. Once you have the length of your paddle figured out then it is time to decide which material of a paddle you are needing. Paddles come in plastic, nylon, fiberglass, and carbon-fiber materials so you need to know how hard you are going to work the paddles. The better the material means greater fatigue reduction. For more detailed information, check out our guide, How to Choose a Kayak Paddle. If you use a sit-in kayak, pack a bilge pump to get water out of your hull in case too much water splashes in, and consider using a spray skirt to avoid the water collecting in the first place. If you’re carrying any camera gear or a phone with you, keep waterproof bags so that they don’t get ruined. Even if you have a self-bailing kayak that has holes to let out water, it is not a bad idea to have a bilge pump on board. There are models that are small and lightweight so they will not take up much space. There is a wide variety of kayak options out there, but I will just focus on a big choice that many beginners face: Sit-on-top kayaks or sit-inside kayaks. Sit-on-top kayaks are great for starting out. These feature an enclosed hull, and kayakers get to spread their legs out in the open. They are beginner friendly, not at all claustrophobic or confining, and have holes that can allow water to drain through with little effort. Sit-inside kayaks, on the other hand, have riders step into the enclosed hull. They are a little harder to get into but are far warmer and more comfortable in cooler environments. They are easier to control as well, though they may need a spray skirt and bilge pump in case water gets in. Look at your use cases, check out these attributes and pros and cons of each type of kayak, and decide based on your needs. 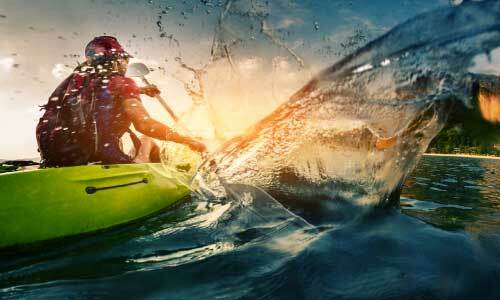 For more detailed information, check out our guide How to Choose a Kayak. The process of boarding and launching your kayak depends on whether you are going to start on land or in water. If you are starting on land, find a smooth and level area to start off with and get in, then push in. It’s fairly straightforward, but of course, requires unique land conditions like a dock. If you are starting on water, then you should board in the shallows. Ensure that your cockpit is at a height that you can stand in, then lay out the kayak parallel to the shoreline. 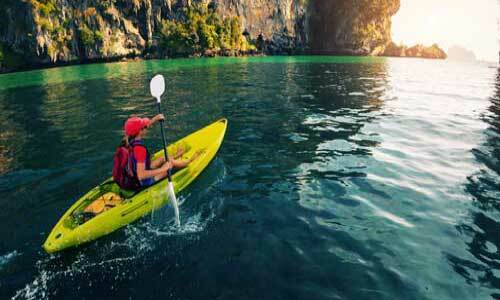 Use your paddle laid out perpendicularly to the kayak to balance and support yourself on the shore – do not put too much weight on it – squat next to the kayak, and slip into the boat while boosting yourself up. You can reverse this process to get out of your kayak in similar waters. Paddling requires a lot of practice, but the basics are easy enough to get a hang of. Start with a proper hold on the paddles – hold it with both hands and center the shaft above your head. If your elbows are at right angles, then you are at the proper position. Ensure that each blade has its longer edges up top. Make sure that your knuckles are aligned along the top edges of your paddles. Here are a few details about the paddling strokes all paddlers will use. The most basic stroke that you will use is the forward stroke. This is basically the exact opposite of the forward stroke. When you need to turn, this is the stroke you will perform. When you are wanting to move sideways in your kayak, then you will perform the draw stroke. You should never leave your kayak outside exposed to the elements, the heat can deform the plastic, ruining the hydrodynamic design. You should never lay your kayak on a hard surface for extended periods, as this can cause the kayak to sag under its own pressure. You should never store your kayak with the cockpit uncovered. This is especially important if you have a sit-inside kayak, these little caverns can become a cozy home for spiders and other small insects. Not the kind of surprise you want while you are out on the water. Kayaking is growing for a reason, and it is definitely something I can encourage everyone to get into. Just remember to keep all the safety tips in mind, and practice the basics as much as you can, and you’ll be ready to venture into this awesome water activity without a hitch. For more information on kayaking, be sure to check out more kayaking how-to guides.